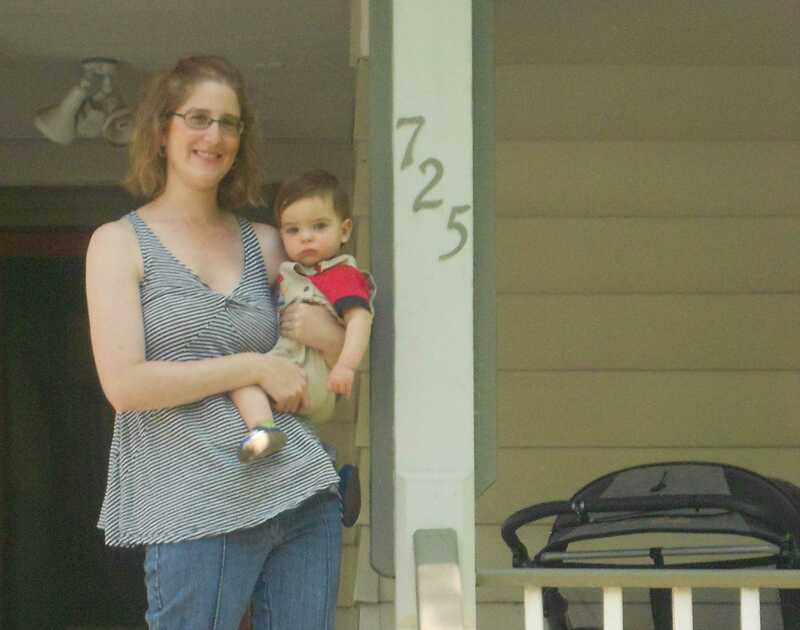 Megan Abraham holds her son Leo on the front porch of their home in the 700 block of Noyes Street, where she says two American flags have gone missing. She lives next door to Feinberg Prof. Mark Waymack, who resigned from Northwestern earlier this month, citing student misconduct in the neighborhood. An Evanston resident for more than 40 years, John Blades has watched Northwestern students gradually make up a larger part of his neighborhood in the 2000 block of Maple Avenue. Throughout occasional late-night parties, he and his wife have maintained a friendly relationship with student neighbors and invited them to dinner twice, once to celebrate their graduation. Still, Barbara Blades said she worries what this fall’s batch of student renters may bring. Town-gown relations are once again in the spotlight after Feinberg Prof. Mark Waymack resigned earlier this month, citing student misbehavior near his home in the 2200 block of Sherman Avenue, two blocks west of NU’s Evanston campus. In a letter addressed to University President Morton Schapiro and read by Ald. Judy Fiske (1st) at a City Council meeting, Waymack partially blamed NU for not doing enough to ensure students behave themselves. Waymack is not a lone dissident among the thousands of Evanston residents who live west of campus. Some of his neighbors say they sympathize with his situation and regret its effect on a city-University relationship Schapiro has touted as on an upswing. The mother of three children, Megan Abraham moved two years ago from Wilmette to her home one door east of Waymack’s in the 700 block of Noyes Street. Her 6-year-old son took a liking to American flags, so she hung one in front of her porch last year. After Abraham discovered the flag was gone, she said she filed a police report. She waited until after Dillo Day to replace the missing flag, but it too went disappeared late one night, she said. Waymack said an American flag was stolen from his porch on Memorial Day, which offended him because many members of his family have served in the military. Beside the missing flags, Abraham said she has had few troubles with students and appreciates the vitality NU brings to the neighborhood. However, she has taken preventative measures, surrounding her recently seeded front lawn with caution tape. From the University’s perspective, its relationship with Evanston is nowhere near the contentious state it was in when Schapiro became NU’s 16th president in 2009. “We’ve invested long and hard in town-gown relations,” Schapiro said during the second of two annual forums during Spring Quarter. The same year Schapiro was inaugurated, NU landed on the Princeton Review’s list of the top 10 schools with the worst town-gown relations. At the forum, Schapiro said he believes NU is now competitive for another list: the top 10 schools that get along the best with their respective towns and cities. Abraham’s neighbors also take the good with the bad, admitting they are willing to trade off a typical suburban life to live in a college town. Evanston resident Frances Caan said her family enjoyed living a block away from campus since they moved in last September. During Dillo Day, her daughter watched students party nearby their home during the musical festival. Neighbors let their guard down during Dillo Day because they know it is a time when students let loose, said Susan Swanson, who lives in the 2100 block of Maple Avenue. However, Noreen Metz, who lives in the 2100 block of Sherman Avenue, said some behavior still crossed the line. She recalled hearing someone ask another person if she could pee nearby her home. Waymack said a lack of education provided by NU on the dangers of alcohol abuse is one of many factors that have strained town-gown relations. Compared with student safety issues, though, sporadic misbehavior is trite, Swanson said. She recalled her friend giving an intoxicated Northwestern student a ride home when no one was else was around to take care of the student. Sherman Avenue resident Arlet Ned said she also prioritized student safety over occasional misbehavior. “Better everyone take care of everyone to be safe first and after that they can complain,” she said. McCormick Prof. John Bayldon, who lives in the 2000 block of Maple Avenue, said some of NU’s policies aimed at curbing alcohol abuse are hypocritical. For example, the alcohol-free housing policy for several fraternities and all sororities encouraged many Greek students to move their parties off campus, he said. Barbara and John Blades said they try to help town-gown relations by keeping in touch with the city and NU. One of top challenges in the relationship are students who have a sense of entitlement when living in a residential neighborhood, John Blades said. “Some students feel like it’s their neighborhood rather than a shared neighborhood,” Barbara Blades said. Still, they said it is disappointing Waymack chose to leave the neighborhood over the natural tensions between students and residents. “To me, actually, it is sad it had to come to that point when he felt could not represent the school,” Swanson said. Assistant summer editor Edward Cox can be reached at edwardcox2011@u.northwestern.edu. Follow him on Twitter at http://www.twitter.com/EdwardCox.